With VAPEXTECH, you benefit from our 16 years of experience in offering high-tech NiMH rechargeable batteries, especially for High-Capacity and High-Rate (HR) batteries. Our Green Technology has created a brand new type of NiMH rechargeable battery, the ‘Ready-to-Use’ battery, our ‘instant’ series - to meet the ENVIRONMENTAL, ECONOMICAL & CONVENIENCE needs of our customers. This is an all-in-one solution. A range of Battery Chargers also make it easy to use our rechargeable batteries. Premium chargers can be used for years, resulting in considerable savings. 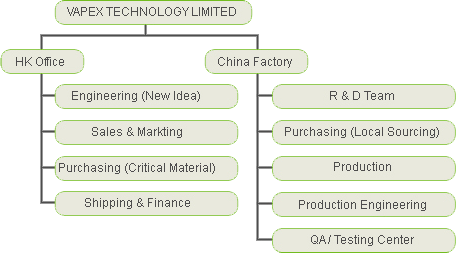 In addition, we have obtained a number of industry certifications to ensure the quality of our services and products. Our new products also comply with European RoHS environmental standards, which means that all raw materials must be recyclable -especially metal parts and plastics. VP series R/C NiMH & R/C Li-Po / R/C LiFe battery packs are widely used in Competition and Hobbies, including RC cars, RC boats, RC aircrafts, receivers and transmitters, Sumo robots and AEGs. VAPEXTECH also provides high-capacity batteries including AAA, AA, C, D, M and 8.4V-PP3 and 9.6V-PP3 batteries for all electronic equipment. A variety of cordless phone batteries, FRS, GPS and Bluetooth batteries are available according to different market demand. We operate two factories in China. We have 790 production staff and 35 engineers to ensure effective support for your ODM/OEM orders. Our daily production is 200,000 NiMH batteries and 60,000 Li-Po / LiFe batteries. Our headquarters in Hong Kong offers world-class sales services and will closely follow your orders to ensure they are completed on time and on target. VAPEXTECH, we not only demonstrated the technical capabilities, but also demonstrated our determination to lead the markets.